This morning at around 8:20am in Parsons Green, South West London, a fireball was reported to have flown through the tube carriage after an explosion occurred inside which burned passengers, and after that, a panicked stampede ensued which has also injured many people as they fled from the scene. 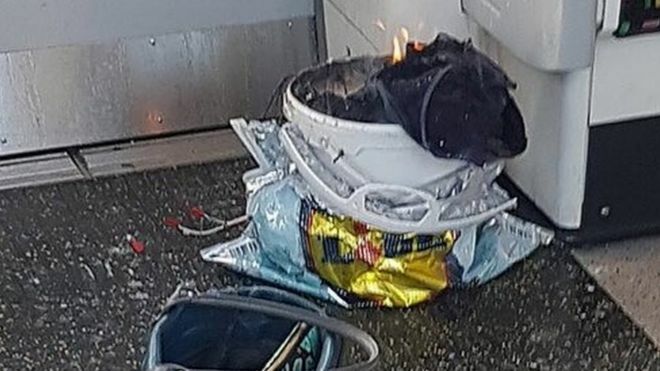 People at the scene are being treated for facial injuries, now on social media photos are coming out, reporting a white bucket inside a supermarket bag left inside the carriage on the scene, with wires hanging out of it. The news media have yet to confirm it is a terror attack, but surely this is yet another terror attack on London, given the presence of a device and this looks like another serious attempt at a terror attack on London. Further details are still to come. Several people have been left with facial injuries from the fireball. The tube train was near the Parsons Green tube station, not far from Fulham, and after the incident had occurred, paramedics and police swarmed the scene of the crime. Special police operatives are currently patrolling the train line, and the tube services have been suspended on the District line between Edgware Road and Wimbledon. Stay well clear of the area if you can and once again, let’s pray for London. So far, there are no fatalities being reported. We wait further updates. An increased number of police officers are at London’s Tube and train stations ahead of Friday evening’s rush hour.